Martin Luther nailing the 95 Theses to the door of the Castle Church in Wittenberg is one of the iconic images of the Reformation. In this essay, historians Volker Leppin and Timothy Wengert examine the best evidence for and against this famous story. In either case, it is correct to say that Luther posted the 95 Theses on October 31, 2017: that is the date listed on the cover letter that he mailed—posted—to local German bishops. Essay: “Sources for and Against the Posting of the Ninety-Five Theses” by Volker Leppin and Timothy Wengert, LQ 29 (2015), 373-398. All essays linked in this timeline are offered solely for personal and educational usage. Video: Timothy Wengert, “The Reformation: 500 Years Later"
Philip Melanchthon’s addition to the University of Wittenberg in 1518 marked the beginning of Reformation partnership that lasted for more than a quarter of a century. In this reflection on his career, Heinz Scheible introduces readers to Melanchthon and corrects many of the misunderstandings that surround Luther’s longtime colleague and the Praeceptor Germaniae (teacher of Germany). Essay: “Luther and Melanchthon” by Heinz Scheible, LQ 4 (1990), 317-339. 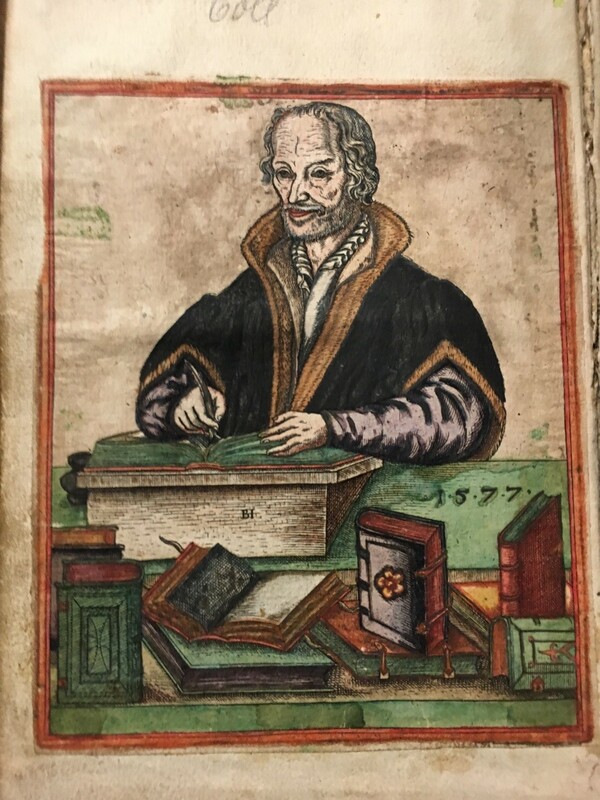 Image: Colored woodcut of Philip Melanchthon (dated 1577) included into a German version of Melanchthon’s 1536 Loci Communes, rare book collection of Wartburg Theological Seminary. Photo by Martin Lohrmann, used with permission. Amid the tumult of the Peasants War of 1524/25, Martin Luther married Katharina von Bora in a private ceremony in June 1525, a marriage which he viewed as an affirmation of life amid perilous times. Martin and Katie were married over twenty years, until the reformer’s death in 1546. Their relationship was characterized by mutual love and respect. In this essay, Martin Treu describes Katharina’s many major contributions to the Reformation. Essay: “Katharina von Bora: The Woman at Luther’s Side” by Martin Treu, LQ 13 (1999), 156-178. Holy Roman Emperor Charles V invited his protesting subjects to defend their faith at the 1530 imperial meeting in Augsburg. Composed primarily by Philip Melanchthon, the Augsburg Confession remains foundational for the preaching and teaching of Lutheran churches around the world today. Author Eric Gritsch (d. 2012) was a longtime professor of church history at Gettysburg Seminary and a noted ecumenical theologian. Essay: “Reflections on Melanchthon as Theologian of the Augsburg Confession” by Eric Gritsch, LQ 12 (1998), 445-452. In a project that began with Luther’s translation of the New Testament (1522), the entire German Bible was published in September 1534. Though it often carries the name “the Luther Bible,” this translation was the work of a team whose members included Luther, Melanchthon, Caspar Cruciger, Johannes Bugenhagen, Justus Jonas, Matthäus Aurogallus, and Georg Rörer. Here Birgit Stolt studies Luther’s great ability to communicate both meaning and feeling. Essay: “Luther’s Translation of the Bible” by Birgit Stolt, LQ 28 (2014), 373-400. Martin Luther’s death in early 1546 occurred just as new challenges were developing for Lutherans: the Roman Catholic Council of Trent had just begun and Emperor Charles V was about to declare war against his Protestant subjects. In this context, Luther’s longtime colleague Johannes Bugenhagen preached a funeral sermon, which recognized the community’s grief and announced the same gospel that Luther spent his life sharing. Essay: “A Christian sermon over the body and at the funeral of the venerable Dr. Martin Luther, preached by Mr. Johann Bugenhagen Pomeranus, doctor and pastor of the church in Wittenberg,” translated by Kurt K. Hendel. Although Emperor Charles won the Smalcaldic War in 1547, an uprising organized by Moritz of Saxony in 1552 eventually brought about the Peace of Augsburg, which granted legal status to the faith of the Augsburg Confession within the Holy Roman Empire for the first time. On the principle of cuius regio, eius religio (whose region, their religion), local nobility or city councils could choose to embrace Reformation teachings and practices. As examined in this essay by James Estes, Luther had laid the practical and theological groundwork for this cooperation between church and state as early as 1520. Essay: “Luther on the Role of Secular Authority in the Reformation” by James Estes, LQ 17 (2003), 199-225. From its outset, the Lutheran Reformation was an international movement. Reforms often included translation of the Bible into vernacular languages and new church orders that described how local communities would live out their gospel faith. Lutheran communities especially took root around Germany, Eastern and Central Europe, and Scandinavia. A taste of this diverse witness appears in this essay by Luka Ilić on the “Slovenian Luther,” Primus Truber. Essay: “Primus Truber (1508-1586): The Slovenian Luther,” LQ 22 (2008), 268-277. On the fiftieth anniversary of the presentation of the Augsburg Confession, German Lutherans published the Book of Concord as a way to affirm their faith and close an era of theological controversy. Its contents include the Augsburg Confession, Luther’s catechisms, and the Formula of Concord by second-generation reformers. From a Lutheran Quarterly issue dedicated to the publication of a new English edition of the Book of Concord, Irene Dingel examines the extent to which the Book of Concord met its goals. Essay: “The Preface of The Book of Concord as a Reflection of Sixteenth Century Confessional Development” by Irene Dingel, LQ 15 (Winter 2001), 373-395. Image: Title page to a 1580 edition of the Book of Concord, rare book collection of Wartburg Theological Seminary. Photo by Martin Lohrmann, used with permission. Essay: “Luther on Music” by Robin A. Leaver, LQ 20 (2006), 1-21.